Today is another challenge at The House That Stamps Built, and this week it's a designer's choice challenge and it's Esther's turn to challenge us. Her challenge is "Summer Vacation". How about a beach vacation and building sandcastles in the sand? My card uses RI# 9016-M "Sandcastle" and RI#9003-E "Happy Summer" and RI#5105-I "Cloud Sil (lg). I did a little no line coloring with Copic Markers on this card, highlighting with my white gel pen and sponging Mustard Seed and Squeezed Lemonade Distress ink along the edges. The cloud was stamped with Faded Jeans Distress Oxide Ink. Thanks so much for stopping by and I hope you'll play along in Esther's challenge with us. All the details of how you can enter and what you could win can be found at The House. Check out my awesome team mates for more Summer Vacation inspiration. Cheri, your card is so happy in yellow! Love your take on the challenge this week -- I always tend to put the ocean behind my main image, but I love how you have it in front! Such a pretty card! 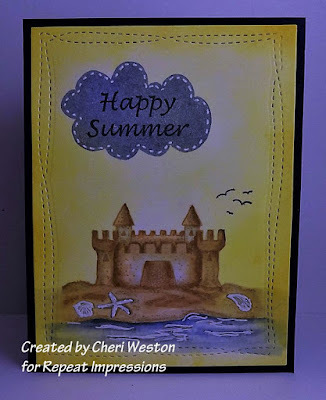 Beautiful card and color choices, I'd like a vacation day at the beach building sand castles! I'd like to be at the beach building a sandcastle right now! Hope you're feeling better! Wonderful take on the challenge. Beautiful card! It definitely looks like summer vacation to me!